This recipe will yield four burger patties. For best results, cook outdoors on a gas or charcoal grill. As an option, top the burgers with sliced mozzarella cheese or sliced provolone. Combine all of the ingredients in a bowl. Mix well. Refrigerate for at least one hour before forming into patties. Combine the minced garlic and the sea salt in a mixing bowl (which is large enough to hold the pasta and the broccoli rabe). Mash the garlic and the sea salt with a fork to form a paste. Add the anchovy paste, the crushed red pepper flakes, and the black pepper. Mash again. Add the lemon juice. Whisk until it is combined well with the other ingredients. Continue to whisk while slowly drizzling in the olive oil. Whisk until the dressing is well blended and thickened slightly. Taste and add more pepper and/or sea salt, if desired. In the meantime, cook the pasta in a pot of salted, boiling water according to the package instructions. Add the broccoli rabe during the last five minutes of cooking time. Drain the pasta and the broccoli rabe well in a colander. While the pasta and the broccoli rabe are both still hot, add them to the bowl with the dressing. 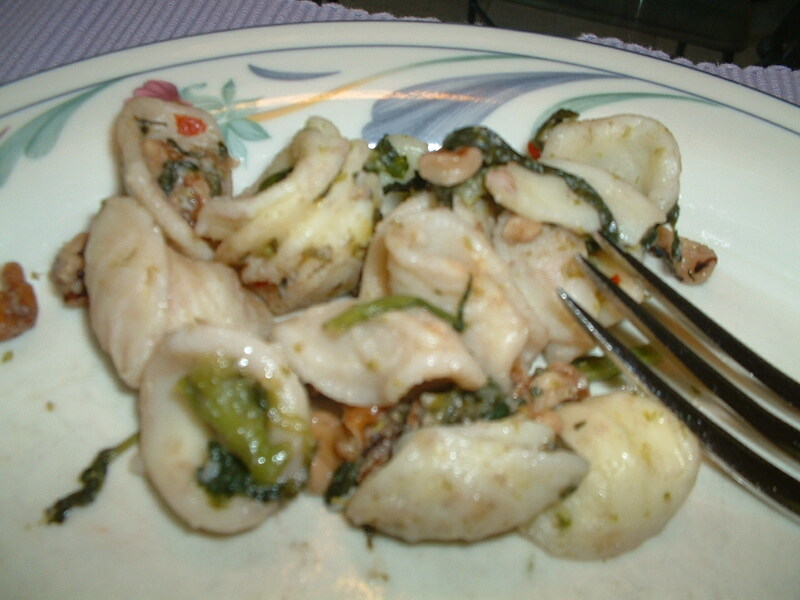 Mix well so that the dressing evenly coats the orecchiette and the broccoli rabe. If the pasta appears a little dry, add some more extra virgin olive oil and mix it through. Garnish the top of this pasta dish with the roasted walnuts and serve it with grated cheese. 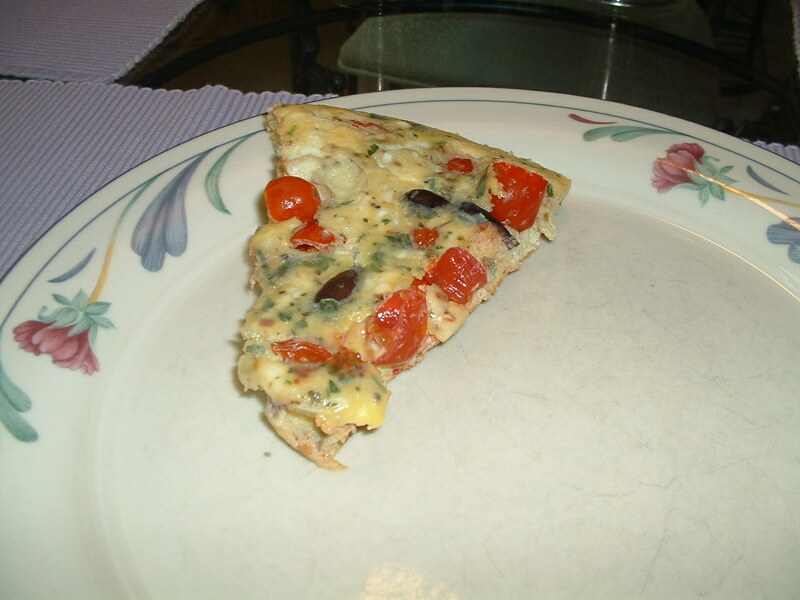 Combine all of the ingredients except the olive oil in a mixing bowl. Whisk the egg mixture until well blended. Add the olive oil to a 12-14 inch non-stick ovenproof skillet. Place the pan on medium high heat until the oil begins to smoke slightly. Add the egg mixture to the hot pan. Let the eggs cook without touching until the eggs are set around the edges. Place the skillet in the preheated oven. Let the frittata bake until the eggs are firm to the touch in the middle. Cut into wedges and serve. Combine the yogurt, a minced garlic clove, the lemon juice, the oregano, ½ teaspoon of sea salt, and ¼ teaspoon of black pepper in a bowl. Mix well. Taste and add more sea salt and/or black pepper, if desired. Refrigerate until 30 minutes before serving the lamb. Combine the breadcrumbs, a tablespoon of olive oil, a minced garlic clove, the rosemary, the thyme, ½ teaspoon of sea salt, and ¼ teaspoon of black pepper in a bowl. Mix well until the breadcrumbs are thoroughly moistened with the olive oil. Note: If too dry, add a little more olive oil. Set the breadcrumb mixture aside. 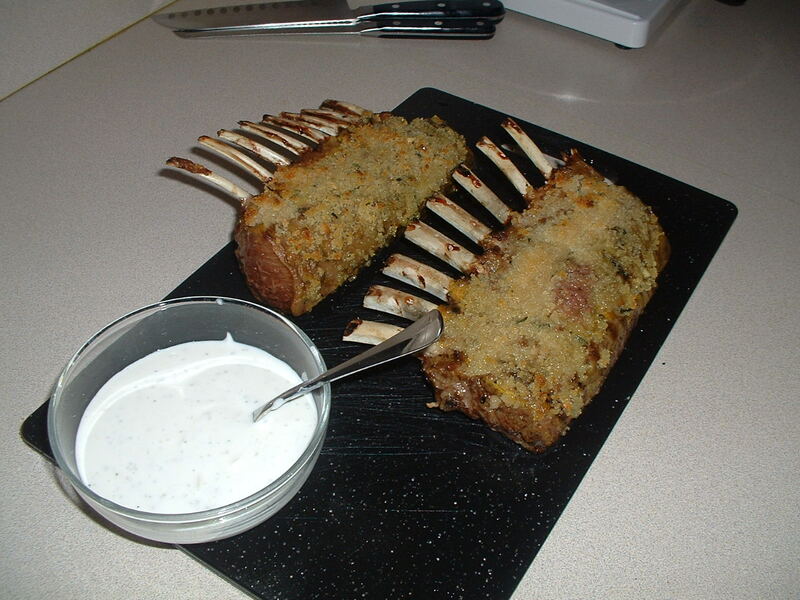 Sprinkle the rack of lamb with ½ teaspoon of sea salt and ¼ teaspoon of black pepper. Sear the lamb for three minutes on each side. You can accomplish this step either on a gas grill (easiest) or in a non-stick skillet brushed with olive oil. While the lamb is still warm, brush the meat side with the yellow mustard. Next, take the breadcrumb mixture and smear it on the meat side evenly. Preheat the oven to 375 degrees. Place the rack of lamb (bone side down) in a roasting pan. Roast in the preheated oven for 18-20 minutes. You want to achieve an internal temperature of 135 degrees for pink, juicy meat. Check the temperature with a meat thermometer after 15 minutes. Rest the meat for 5-10 minutes before cutting into chops. Serve with the yogurt sauce. Add the green beans and a teaspoon of sea salt to a pot. Add enough cold water to just cover the green beans. Bring to a boil. Cook for three minutes. Drain the green beans in a colander and put them into the refrigerator for later use. Whisk together the chicken stock, the soy sauce, and the cornstarch. Set the mixture aside. Add the sesame oil and the canola oil to a 12-14 inch wide non-stick skillet. Put the pan on medium high heat for three minutes. Sprinkle the shrimp with sea salt and black pepper. Cook the shrimp in the hot oil for two minutes on each side. 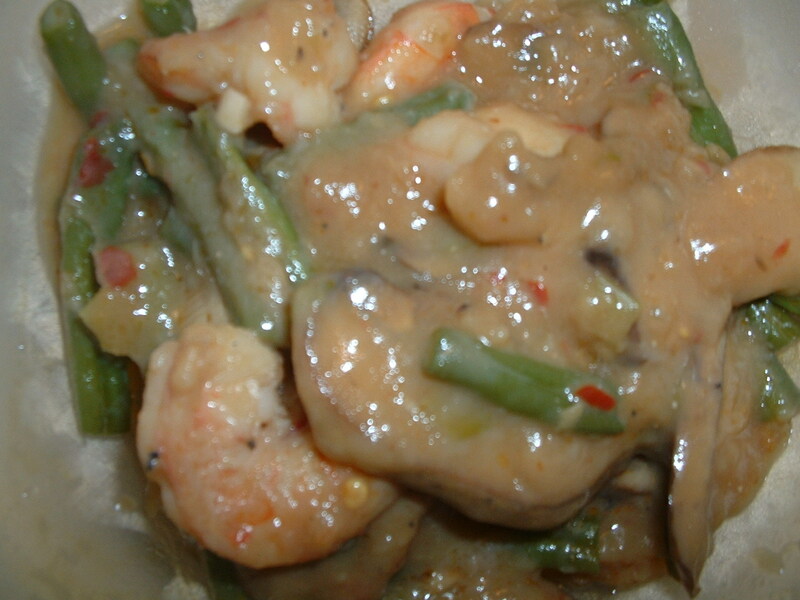 Remove the shrimp to a plate. Add the mushrooms to the same skillet and cook them for 4 minutes on each side turning them only once. Note: if the mushrooms absorb all of the oil, add a little more canola oil to the pan. Add a dash of sea salt, a dash of black pepper, the Sriracha sauce, the ginger, the garlic, and the green onions to the pan. Cook while stirring for one minute. Add back the shrimp along with the green beans to the skillet. Cook while stirring for two minutes. Give the chicken stock and cornstarch mixture a final stir if the cornstarch has settled to the bottom. Add the chicken stock and the cornstarch mixture to the pan. Stir thoroughly. Let the mixture cook on low heat until the sauce thickens. Taste and add more Sriracha sauce, sea salt, and/or black pepper, if desired. Serve while hot with steamed brown or white rice.